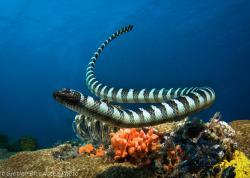 Strobes, also known as flashes or flashguns, are very important in underwater photography. One, two, and sometimes even 3 or 4 strobes underwater are used to light subjects. Strobes can be places in different positions for different effects. 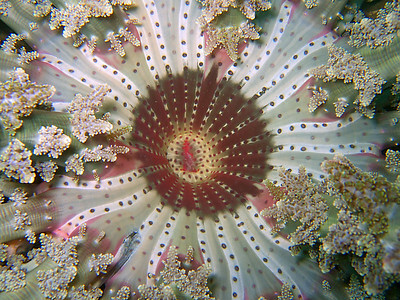 Example of an underwater strobe. In this case, an Inon Z-240. I want to take a moment to explain how most modern flashes fire. If strobes are on manual power, your strobe will light up for a certain duration, depending on the power setting. Even the maximum duration, aka "a full dump", is very short, around 1/500th of a second, but it depends on the strobe. When you change power settings, the intensity of the strobe does not change, only the duration is effected. If you use less than full power, the strobe output will be a shorter duration. The expression "quenching the strobe" means the strobe output is stopped before its maximum duration is over. When TTL is used with strobes, a pre-flash is fired first to measure exposure. The result of the pre-flash is analyzed, and the proper duration of the full strobe output is calculated. This pre-flash is very fast, and not visible to the eye. 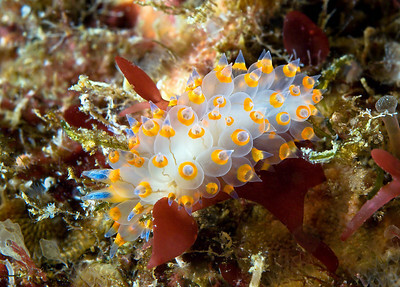 Most color is absorbed as it travels underwater. Shorter wavelengths (red, orange, yellow) are absorbed first. Most photos taken UW without a flash look drab and blue due to this wavelenght absorbsion. 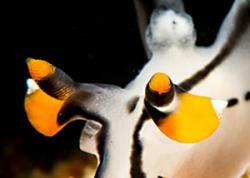 Unless the water is very clear and the subject is very close, the internal flash on a camera will produce backscatter. Unless the light is very bright, most UW photography shots with ambient light, especially macro shots, will look blurry due to a slow shutter speed. A strobe or flash supplies light at a high speed, allowing you to shoot sharp photos. People often talk about the “quality of light”, or whether light is “Hard” or “soft”. Hard light is strong, directional light that creates distinct shadows, strong contrast. Soft light is diffuse, coming from different directions, creating soft shadows and less contrast. The smaller the size of the source of the light, the harder the light is. There is no correct light to use, you must choose the quality of light you want for the type of photograph you wish to produce. Diffusers spread out the light (increase angle of coverage), which is better when shooting wide-angle. They lower contrast and soften shadows. Diffusers can lower the color temp of a strobe by 300-500 Kelvin, depending on the diffuser. Check with your strobe documents. For example, the S&S diffuser will lower the color temp, while the Inon diffuser will not. Diffusers reduce the power of a strobe by 1/2 to 1 stop, depending on the diffuser. The further away the subject is from the strobe, the less effect a diffuser will have. This is because light becomes harsher as the source is further away. Some people use them when they feel their strobes are "too strong." Many people have made their own diffuser. Plastic milk jugs work, as do any kind of clear or frosty plastic bottle or translucent material. Experiment a little bit. I usually use 1/2 stop diffusers when I shoot with my Inon strobes, but some people don't use them, its a personal choice. The important thing is to understand their effect, and take shots with your diffusers on and off, so you understand the difference. Then, you can decide when you want them on, and when you want them off. There is no "correct" choice, but the results will be different. Strobe falloff is a property of strobe lighting. The rule states that the light from a strobe decreases in power proportional to the square of the distance from the strobe. The formula is: Strobe power = C/(X*X), where C is a constant, and X is the distance between the strobe and the subject. Moving a subject from 1ft to 2ft away from a strobe will reduce its power by 1/4th. Moving a strobe from 1ft away to 6 inches away will increase its power by 4 times. Light from the front emphasizes color and vibrance. Shadows can be less pronounced since they fall behind the subject. Details are emphasized less. This is the easiest type of light to shoot and expose. The internal flash of a compact camera, and a ring flash both produce front lighting. You can also pull in your strobes right againt your camera housing, or even better, your port. Frontlighting shows even light and few shadows. 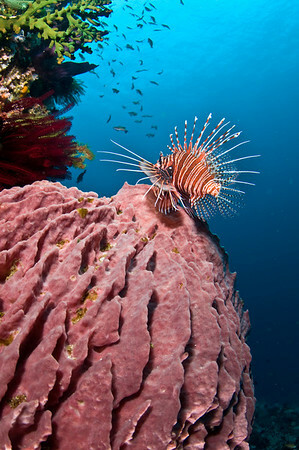 Taken with Fuji F11 in Lembeh. Light from the side emphasizes details, and enhances the shape, and especially the texture. Deep shadows and high contrast can be produced. Strobes can be moved out to the sides. 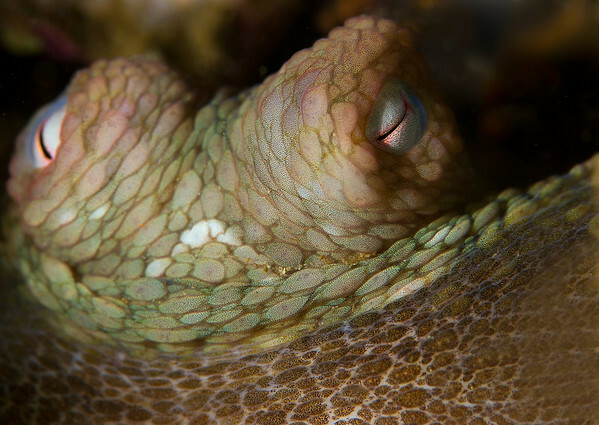 I used sidelighting to bring out the texture in this octopus closeup in california. D80, 105mm lens, F11, 1/200th. The light comes from behind. Backlighting will light up the rim of the subject, and will cause them to glow if the are translucent. Backlighting will emphasis shape and form, and produce bright highlights. Saturation is greatly reduced. Backlighting works best with translucent subjects, or subjects with strong shape or form. Backlighting with the sun is discussed further in the silhouette section. 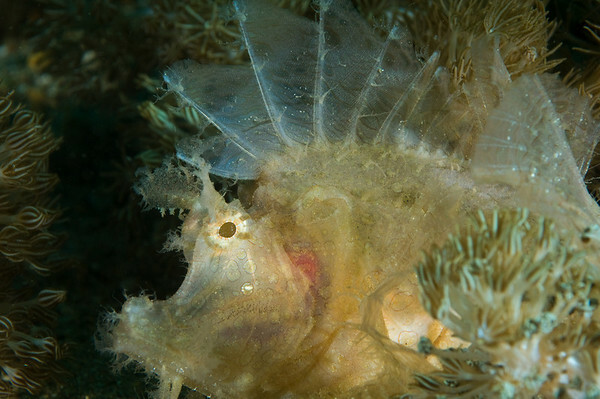 Backlighting subjects with a strobe is covered under creative underwater shooting. This nudibranch was lit from the top and slightly behind, giving it a slight glow. Photographers shooting with one strobe will sometimes light their macro subject from the top, mimicking the angle from the sun. This is a combination of front and side lighting, giving a slightly different effect. Move one strobe closer to the subject than other. Use a diffuser on only one strobe. Use your strobes on manual power (instead of TTL) and put them on different power settings. There is no correct lighting. Some subjects will look better with frontlighting, others do well with sidelighting. Translucent objects can look good with backlighting. You need to experiment. Two strobes are always better, because it gives you more lighting options, and more ways to reduce backscatter. However, you can easily produce beautiful macro photos with only one strobe, your lighting will just tend to be more direct and even. 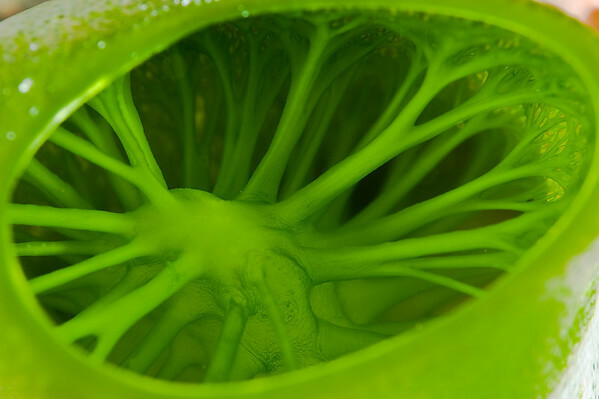 So don't hesitate to shoot macro with one strobe if that is all you can afford. If you are using strobes, you should set your camera white balance to auto, or to the color temp of your strobe. Note that diffusers will slightly lower the color temp of your strobe (usually around 5000K). Please note that when shooting wide angle, the color temp of your background will be the color temp of your strobes. This may not give you the desired blue or green color in your background you want, so advanced photographers will either use different strobes with different color temps depending on the water, or they will gel their strobes. 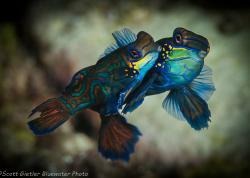 See the creative underwater shooting section for more details. A snoot allows you to place light exactly where you want it, in a small area. 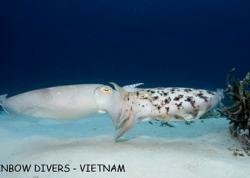 Read more in our guide to underwater snoot photography. Placing Lee or Rosculux gels over your strobes can change the color temp of your strobe. These gels are also known as color correction filters. This can be useful for slightly warming or cooling your subjects, and also for getting the correct color temp of your background. Colored gels can be cheaply purchased, cut with scissors in a circle the same shape as your strobe, and placed behind your diffusers. For my INON strobes I also had to use a sewing needle to poke a hole in the filter that the diffuser screw went through. I use Lee color correction filters to lower the color temp of my strobes from 5500K to 5000K and 4500K. This will result in warmer lighting, and deeper blues when shooting in tropical water. You can experiment with other colored gels for different effects. I use Lee 1/4 CTO color correction filters to lower my strobe temperature to 4500K for blue-water wide angle shots. Read more about getting good blues in wide-angle shots. A ring flash strives for shadow-free macro photos. Because the light is coming directly from the front, shadows fall directly behind the subject. See the front-lighting section for more details. Inon and Athena both make ring flashes. Note that ring flashes are not TTL-compatible, and must be used on manual power settings. 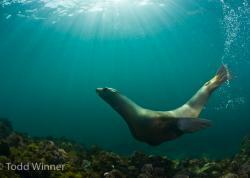 Alex Mustard wrote a great article on ring flashes in Underwater Photography magazine issue #47 here. He even discusses how he made his own ring flash. One interesting conclusion he made is that the lighting looks very similar to just bringing both strobes against the sides of the port, for direct front-lighting. Submitted by Benj (not verified) on Thu, 2012-12-13 17:21. "The rule states that the light from a strobe decreases in power proportional to the square of the distance from the strobe. The formula is: Strobe power = C/(X*X), where C is a constant, and X is the distance between the strobe and the subject. Moving a subject from 1ft to 2ft away from a strobe will reduce its power by 1/4th. Moving a strobe from 1ft away to 6 inches away will increase its power by 4 times." Using your equation I put into an excel spreadsheet, I have used constant k as 1, as its a constant it doesnt matter what its value is, the distance is represented in feet. So as you can see indeed by reducing distance from 1 foot to 0.5 (6 inchs) the strobe power is increased four times, and then indeed by doubling the distance from 1 foot to 2 foot is reduce TO 0.25. If it were reduced by 1/4 the strobe power would be 0.75. Submitted by Jevin Surjadi (not verified) on Tue, 2012-05-29 21:47.
hello i'm looking to buy lee gel filter to change 5600k to 4500k. according to lee website, the closest filter is #223 but it says here http://www.amazon.com/Lee-Orange-Correcting-Lighting-Filter/dp/B0000AQJ7C that lee #206 converts Daylight 5600k to Tungsten 4600K. can you please tell me which one is right? You are looking for a Mired Shift of 44. Our product 443 is virtually identical to 44. It has a Mired Shift of 42, as opposed to the 223 which is pretty close at 52. The 206 has a Mired Shift of 64 and therefore is not the close product. Submitted by dyingjoker (not verified) on Sat, 2012-04-14 02:18.
thank you Scott,for this great article. however i still got some questions. Because Im not familiar with the Lee system. About the Lee 1/4 CTO you mentioned. is that a orange or red color filter? can you give me a link for that? I could not find it on their website... thank you! 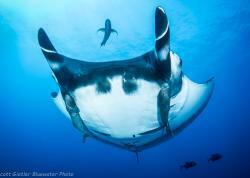 Submitted by Mário Monteiro (not verified) on Mon, 2011-02-28 05:04. First, thank you for helping me improving my uinderwater photography. I have a sony dsc w380 and a mpk-wf housing. 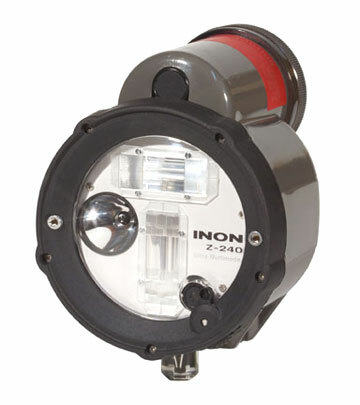 I recently bought the inon d2000 strobe, unfortunatly still haven't received it. My doubt is, i use the underwater program from my w380 and i force the internal flah. One thing i notice is that in most pictures i need to increase color temperature an contrast, cause they seem to have some "fog". I think i need to stop using the undewater mode cause it overexposes pictures, am i right? Submitted by Hoefje77 (not verified) on Sat, 2011-01-22 23:50. If shooting in RAW is there any added value to using gels on your strobes? I use a YS-250PRO and a YS-110a as the backup which produces a cooler light, but I can adjust the light temp in post-production. Submitted by promocop (not verified) on Sun, 2010-05-02 08:42. Submitted by scottg on Sun, 2010-05-02 22:03.
hey promocop, you might have a setting wrong, see if you can get the strobe to work properly in manual mode first. Also, with the strobe on manual you can use your G10 in full manual mode - a big plus! Submitted by Mel Moncrieff (not verified) on Mon, 2010-01-18 19:24. Thanks so much for this great article. I never realized that dialing downthe power only decreased the duration, not the intensity of the strobe, but it makes perfect sense now that I think about it! Submitted by dddiver (not verified) on Sat, 2009-07-11 16:42. Nice article. It generates some questions for me about snoots. Does anyone manufacture snoots for underwtaer strobes? If not, has anyone made one? Under what circumstances can a snoot actually increase the guide number of a strobe by narrowing the beam angle? Does the interior of the snoot have to be reflective for this to occur? How much gain can realistically be achieved? Is one or two F stops feasible? Submitted by scottg on Mon, 2009-07-13 16:37. I haven't seen any underwater snoots for sale recently, but that doesn't mean there aren't any for sale. I'd imagine if you made the snoot correctly you could increase the guide number, and you could also look into using a plastic fresnel lens to get more power in a smaller area.